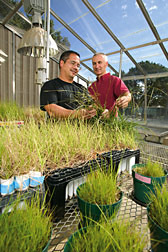 Technician Joe Lee (left) and microbiologist David Douds examine pot cultures of bahiagrass and arbuscular mycorrhizal fungi in the greenhouse. It might be surprising to learn how little is actually known about the role of one of nature’s tiniest and most effective gardeners. Mycorrhizal fungi are organisms that live inside and outside root cells and help them reach for nutrients by extending long threads called “hyphae” into the soil. The hyphae act as extensions of the root system. The plant, in exchange, gives the fungi glucose and possibly other organic materials they need to grow. The most common mycorrhizal fungi, arbuscular mycorrhizal (AM) fungi, colonize most crop plant roots and enhance nutrient uptake, mainly phosphorus. AM fungi have been shown to enhance disease resistance, increase soil’s stability against erosion, maintain soil pores for air and water infiltration, improve soil fertility, and increase concentrations of organic matter in the soil. Unfortunately, AM fungus populations in soils have been diminished by modern agricultural practices. But they can still make important contributions to productivity in systems where little or no chemical fertilizers and pesticides are used, such as in organic farming. 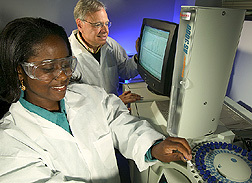 Technician Aisha Abdul-Wakeel places samples into a gas chromatograph while chemist Philip Pfeffer examines mass spectral data to measure the amount of isotopically labeled nitrogen that has been delivered from the mycorrhizal fungus to the host plant. Although home gardeners can buy potting mix with beneficial fungi added, it’s impractical for farmers to buy and apply the amount they would need for their fields. A team of ARS scientists at the Eastern Regional Research Center (ERRC) in Wyndmoor, Pennsylvania, is examining the feasibility of on-farm mass production of AM fungus inoculum already native to a site or introduction of nonnative AM fungi by way of colonized host plants. By learning more about AM fungus physiology and finding ways to grow colonies without host plants, they hope to make the fungi a practical option for producers. Researchers in ERRC’s Microbial Biophysics and Residue Chemistry Research Unit take a three-pronged approach to mycorrhizal research. David D. Douds, a microbiologist, heads the on-farm inoculum production. Philip E. Pfeffer, a chemist, is mainly investigating the fungi’s metabolism and molecular biology. Gerald Nagahashi, a chemist/cell biologist, is studying the fungal life cycle. Pfeffer and Douds collaborated with Michigan State University and New Mexico State University scientists to show the symbiotic relationship between mycorrhizal fungi and plants in nitrogen recycling. Nitrogen is an essential part of proteins, nucleic acids, and other cellular components of living organisms. Though the scientists had identified enzyme activities in AM fungi and genes involved in nitrogen absorption and metabolism, little was known about how nitrogen is transported from fungus to plant root and in what form it is transferred. Using nuclear magnetic resonance, mass spectrometry, and gene expression measurements, they recently established that nitrogen is transported as the amino acid arginine. It takes a novel metabolic route from external hyphae to fungal structures located in plant roots. It is then broken down by the fungus to ammonium, which is transferred to the host plant. Currently, researchers cannot cultivate the fungus without a host. The fungus cannot complete its life cycle without the organic nutrients or other stimuli it receives from roots. Nagahashi and his colleagues have been focusing on events that must occur before the fungus can colonize a host plant. Nagahashi and Douds used in vitro sterile culture techniques to investigate how certain environmental factors—root compounds, blue light from the sun’s spectrum, and carbon dioxide—affect AM fungal growth. They found that these three factors can all work independently to promote growth of AM fungi but were even more effective when combined to operate in synergy. The most effective treatments involved the joint use of chemical compounds with one of the environmental factors. The AM fungus life cycle’s first three steps have been completed in laboratories without a host root. Nagahashi and his colleagues are currently focused on the fourth step—formation of “penetration hyphae,” which enter and develop into a network of intercellular hyphae inside the root. Identifying these compounds could eventually be used to provide researchers with pure fungus spores, the development of which is the life cycle’s final step, and allow them to be cultivated away from host plants. Douds collaborates with researchers at the Rodale Institute in Kutztown, Pennsylvania, which for more than 25 years has compared conventional and low-input, or organic, farming systems at the same site. Some of Douds’s work with mycorrhizal fungi was conducted in Rodale’s Farming Systems Trial, a comprehensive study of organic farming techniques that began in 1981 on 6.2 hectares, which makes it the longest running comparison study of its kind in the United States. Of particular interest to Douds were results showing that plots farmed with two organic systems had greater AM fungi spore populations and produced greater plant root colonization than did soils from a conventional corn-soybean rotation system.—By Jim Core, Agricultural Research Service Information Staff. This research is part of Soil Resource Management (#202) and Plant Biological and Molecular Processes (#302), two ARS National Programs described on the World Wide Web at www.nps.ars.usda.gov. David D. Douds, Philip E. Pfeffer, and Gerald Nagahashi are with the USDA-ARS Eastern Regional Research Center, 600 East Mermaid Lane, Wyndmoor, PA 19038; phone (215) 233-6469, fax (215) 233-6581. "Getting to the Root of the Solution" was published in the January 2006 issue of Agricultural Research magazine.